While we believe data can be an invaluable tool for marketers to provide highly relevant messages to their subscribers, we fundamentally still stick to the anonymity brought by web push. As a result, we generally do not collect any Personally Identifiable Information (PII) from your subscribers, other than those explicitly provided by our users through use of our APIs. That said, occasionally we may introduce new features that enable you to track what may be considered by some to be PII (i.e IP addresses, emails or usernames). 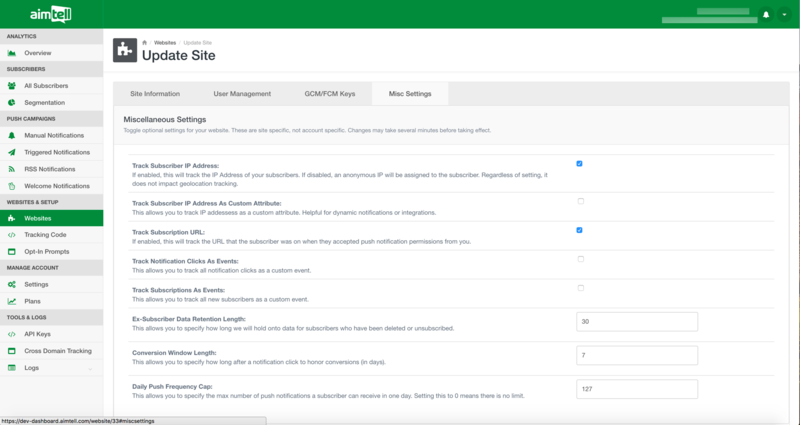 To give you greater control, we allow you to view, enable or disable these data points on a site-by-site basis by going to 'Websites' ->'Edit' -> 'Misc Settings' within your Dashboard. PLEASE NOTE: That it could take up to 30 mins for your enable or disable changes to take effect.